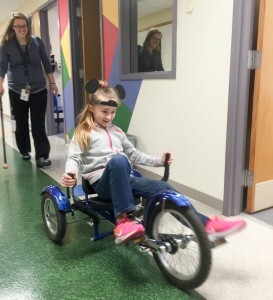 Just as “a spoonful of sugar helps the medicine go down,” occupational therapist Katie Clark believes “all things Disney” makes therapy sessions all the more happy and productive. 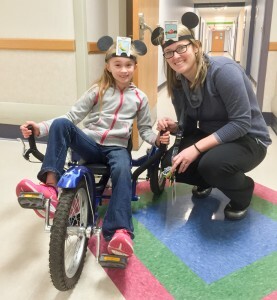 On a recent morning, Katie was spotted with Olivia Pfahler playing the Disney HedBanz board game during the soon-to-be-9-year-old’s therapy session to stretch and strengthen her leg after surgery. Each wore a headband that resembled Mickey Mouse ears with a character card positioned in the center of the forehead. Attached to Olivia’s headband but not visible to her was a card with the image of Tinker Bell. On Katie’s headband but not visible to her was a card with the image of Francesco Bernoulli, a character from the Disney movie Cars 2. Olivia: Am I an animal? Olivia: Am I a bird? Olivia: Am I a person? After a few more clues revealing wings and a green outfit, Olivia nailed it. She was the iconic fairy from Peter Pan. By working in this uncomfortable position, Olivia was able to improve balance, strength and endurance so she’s able to do things that other children her age are able to do: dress herself easily, play on the playground, and keep up with her friends at school. Katie said therapists frequently do fun activities in therapy to improve participation and engagement. In this case, the game was for distraction from discomfort. Distraction techniques, whether it be a board game, toy, music or the help of a therapy dog, often help increase participation from patients. 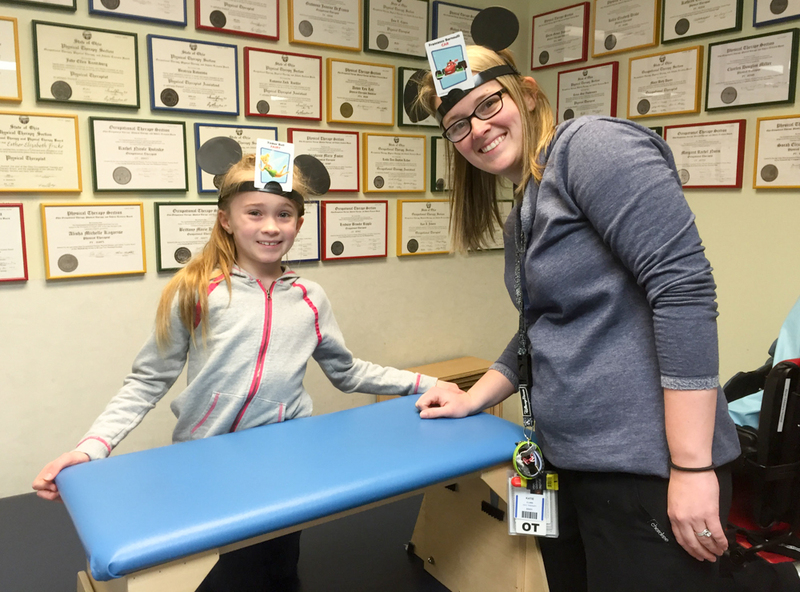 The department is well stocked with games and toys, but when Katie mentioned to Olivia that she had the Disney HedBanz game at home, Olivia begged her to bring that one to work. Katie obliged because she never tires of talking about Disney movies and characters. She’s a true Disney fan after having watched nearly all the Disney movies many times, and having visited Disney World 31 times. She has even completed 2 challenging distance running events called the Dopey Challenge and the Goofy Challenge at Disney World. When asked if all of her young patients are Disney fans, Katie thought for a moment before answering. But she didn’t need to. “Well, if they are not a Disney fan, in the hour she has them, they have to be Disney fans,” said co-worker Mary Beth Doerr with a laugh.